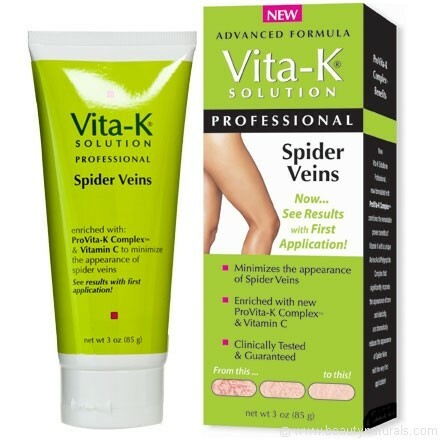 Vita K Solution Professional Spider Veins minimizes the appearance of Spider Veins. Enriched with ProVita-K Complex and Vitamin C it significantly improves the appearance of tone and elasticity. For best results apply a sufficient amount on the desired area twice a day, preferably after shower or bath. Use 4 - 6 weeks continuously for optimum benefits. When desired results are achieved, continue to use once a day to help keep spider veins from reappearing. Results may vary depending on your skin type and condition. Works better than some other spider vein creams, but not as effective as laser removal. Affordable. Absorbs well. Leaves the skin feeling soft and supple. Minimizes the appearance of spider veins. A decent cream that minimizes the appearance of spider veins, but probably not suitable if you have a significant problem with spider veins. "Works better than some other spider vein creams, but not as effective as laser removal."